I went ahead entering the account credentials and Device ID supplied by the customer. While trying to save the Google Play configuration an error message appears “The Google logon request used a user name or password that is not recognized”. The credentials were correct, but the supplied Google Play Store account wasn’t configured for “Access for less secure apps”, which should be turned on to extract application information. To enable XenMobile to extract app information, you may need to configure your Google Play Store account to permit unsecure connections. For steps, see the Google support site. According to the Citrix eDocs the Device ID can be located on your phone by enterung *#*#8255#*#*. Unfortunately my customer was only enrolling Android Tabs and didn’t had any Android Phones available. So how do we retrieve the Device ID for a Android Tab? Fortunately the Google Play Store offers several “Device ID” Apps, which are able to lookup the Device ID for you. However pay attention which App you are using! I noticed not all “Device ID” Apps display the required value as “Device ID”. 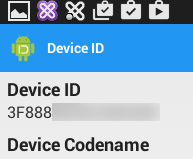 For example “Device ID” by Evozi, which displays an incorrect “Android Device ID”. 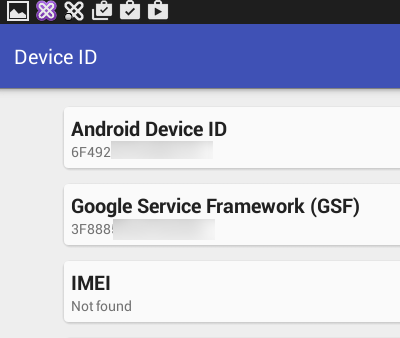 This specific App displays the required Device ID with the “Google Service Framework (GSF)” field. Now that all information was gathered and required settings were changed I was able to save the “Google Play Store” credentials within XenMobile. Soon as you are able to search the Google Play store you’re good to go !